Our April meeting concluded the Spanish sessions for this time. This time we rejoiced that there were no technical issues (thanks to my husband Ian) and we caught up with the Hotel booking we missed last time due to problems. We then went on to Health issues and conversation on these. Our next meeting is Thursday, May 9th, 2019 at John Godber Centre, Byron suite 10.30 to 12 noon when we shall begin the first of four sessions on Italian. Now is a good time to join if you wish (back copies can be provided of missed sessions) If you are a regular group member please bring all your Italian sheets as we shall be revising this time before we move on to new things. 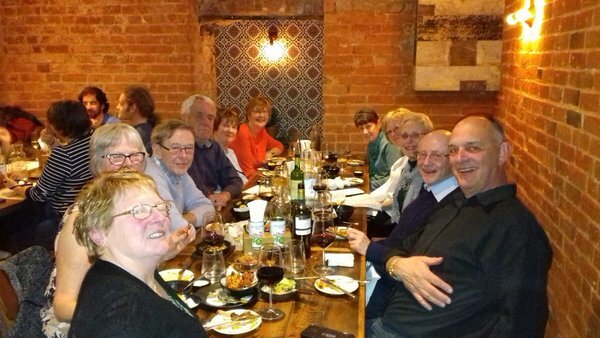 We had an enjoyable tapas meal in April also, thank you Liz for organising that. The food was delicious but the venue a bit noisy! Here we are on the photo. We did indeed have fun and games at our last meeting, but not the sort we really wanted! This was due in the end to a computer update blocking the online videos we were using. Thanks to everyone for their patient understanding. We did manage to complete a vocabulary sheet on hotels and bookings, also a crossword and had lots of hilarity (genuine this time) in our group conversations. The tapas meal will take place at Bar Erico on Wednesday 10th April at 7.0pm. We are sorry there are some who cannot make that date and hope more can make the next meal. Our next meeting, and our last for this session in Spanish, will be at John Godber Centre on Thursday, 11th April at 10.30 – 12 noon. We hope to consider Health matters then. The May meeting will begin four sessions of Italian. We look forward to seeing you all. New members welcome – see the board to sign up please. Our next meeting is on Thursday, 14th March, 2019, 10.30 till 12 noon in the John Godber Centre, Byron Suite. All are welcome. We continue with Spanish and we are looking at booking Hotel rooms. We shall consolidate earlier learning with group work. We are sorry to lose Eve Roussell who is unable to get to the meetings any more. We wish her well. Our January meeting woke us all up with a return to Spanish after several French sessions. We looked at the definite and indefinite Articles, some new vocabulary and gender matching. It was all a bit mind boggling after the Christmas frivolities. Well done to everyone taking part in our Showcase Language ‘Allo ‘Allo Revisited sketch. I think we had more fun practising it than the actual performance! But hopefully the audience had fun watching us! Our next meeting will be on 14th Feb. when we shall continue in Spanish to consolidate our learning, explore more conversation and view a few verbs. it will be as usual in the John Godber Centre at 10.30 till 12 noon in the Byron Suite. See you then! e-mailed members information about the other rehearsal times. The 20th November will be our meal at French Living and the usual language meeting on 13th December in John Godber Centre at 10.30 will be our Christmas nibbles event. Please bring along the items you volunteered or anything you would like to share. 2019 – We are always open to new members so feel free to come along for a taster session. Our meeting in January will be on the 10th at John Godber Centre at 10.30 am in the Byron Suite. We shall be continuing with Spanish so please bring along your sheets for a revision session to start the new year. If you are new and want to come sheets are available. A happy and peaceful Christmastide to one and all.